Pickering and Chatto, 2012, xv + 272 pp. In the aftermath of the American and French Revolutions, the 1790s brought a huge outpouring of poetry and song in support of radicalism in Great Britain and Ireland. 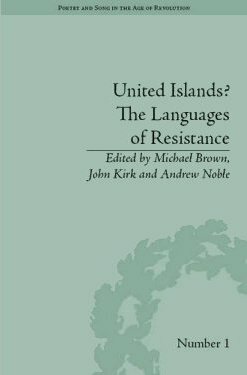 The essays in this volume deal with radical poetry in Ireland, Scotland and Wales, as well as in the regions of England and London, placing the 1790s in a broader historical and cultural context. Much of the material drawn on is non-canonical, unstudied, and in one of the Celtic languages or in Scots or dialect English. The contributors are able to show that reactionary political verse is a pan-British phenomenon, and that the writing of this period has fundamental implications for the history of Britain. They show how poetry and song can reveal the relations between the four nations at this time, particularly that between England with the other three.